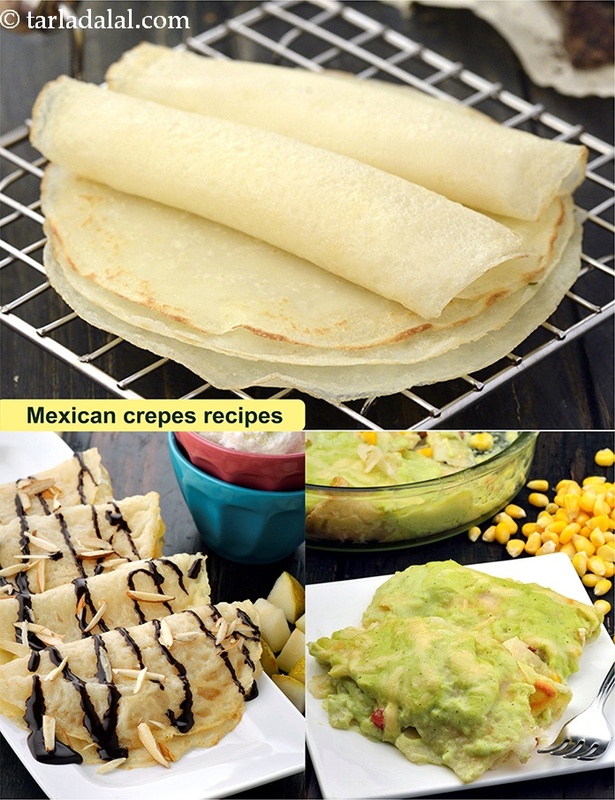 We present you with a small collection of Mexican Crepe recipe. Crepes are thin and soft, you can stuff them with savory and sweet stuffing to make various dishes like Corn and Cottage Cheese Crêpes, Crepes Belle Helene. Melt-in-the-mouth Crepes stuffed with spicy refried beans, cottage cheese mixture and finally topped with a chunky salsa rolled tightly and baked to perfection with generous amount of cheese, makes Crepes Mexicana delectable baked dish. Also, Broccoli Crepes with Mexican Green Sauce made with a broccoli filling and Mexican Green Sauce made of capsicum is a dish that is sure to etch a lasting memory. We show you how to make Eggless Crepes and then use them to make a collection of Veg Mexican Crepes. This recipe is an example of how native Mexican ingredients are adapted to French pancakes. Broccoli and Mexican green sauce make a very tasty combination. Delicate crepes filled with cottage cheese in a creamy makhani gravy. A famous french recipe, ideal for desserts ands served with ice-cream or other sweet sauces. A delicious yet healthy dessert!